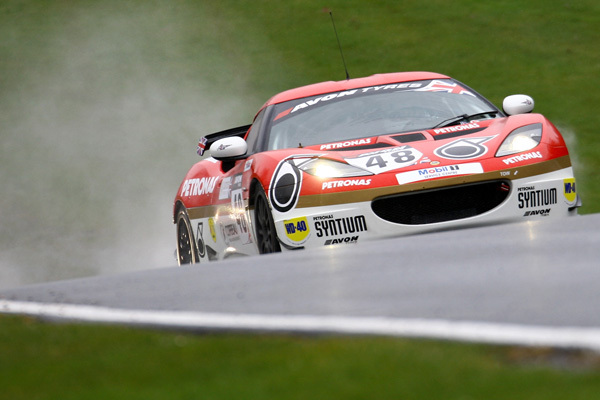 Lotus Sport UK opened their 2012 Avon Tyres British GT Championship account with three podium finishes from two races at the picturesque Oulton Park circuit. In challenging weather conditions Sailesh Bolisetti took to the wheel of the #48 Lotus Evora for the first stint in race one despite only having driven the car briefly in the wet. Promising lap times kept the car in the running for a good finish in GT4 before Phil Glew took over. Setting a stunning pace he reeled in the Ginetta of Hughes and Fannin who had a 1m37s gap at the start of his stint, by the end of the race he had closed that gap down to 37 seconds. Marco Attard started in the #49 Lotus and following a great start kept 3rd place. With a solid pace throughout the race and improving lap times Alistair MacKinnion took over to keep the car in a podium scoring position. Race two saw the #48 car star from pole position with Glew leading the way throughout his stint, he matched the pace of Hughes in the Ginetta and would pull out a 6 second lead by the time he came in for the driver change. Unfortunately for Bolisseti the pace of Jody Fannin in the Ginetta would prove too strong and would lose a place; despite this he would keep his head as others slid off the circuit and bring home the car in a brilliant second place. Alistair Mackinnon started in the #49 car from third place but would lose out as the back end of the Lotus stepped out and dropped him down to fourth place. Attard would put in a solid drive to bring the car home in one piece finishing fourth in class. Sailesh Bolisetti #48: “I had a great weekend with Lotus Sport UK, big learning curve, and horrible conditions that I am not used too!! My team mate Phil helped me no end so that was great. Two second places is a great start to my British GT experience so I’m really happy!" Phil Glew #48: “It’s great to be back with the Lotus Sport UK guys, they do a great job. It was really enjoyable this weekend racing alongside the likes of Warren Hughes and Jody Fannin in such tricky conditions. Sailesh did a great job, lots for him to take on, and in these very wet conditions, he did a great job." Alistair Mackinnon #49: "It was great to be back racing in GT's, the conditions were awful, but I think that myself and Marco did a good job, a podium in the first race was brilliant! The team are a great bunch, and the little Evora was a pleasure to race!" Gary Ayles, Team Manager: "All the drivers drove fantastic races over the weekend in very testing conditions, and also the fact we had no major offs, or damage proves what a professional job the guys did. Our rookie Sailesh coped with all the new things to learn extremely well, and the fact he has only ever raced in the wet a handful of times proved that he will be one to watch in GT's in the future."